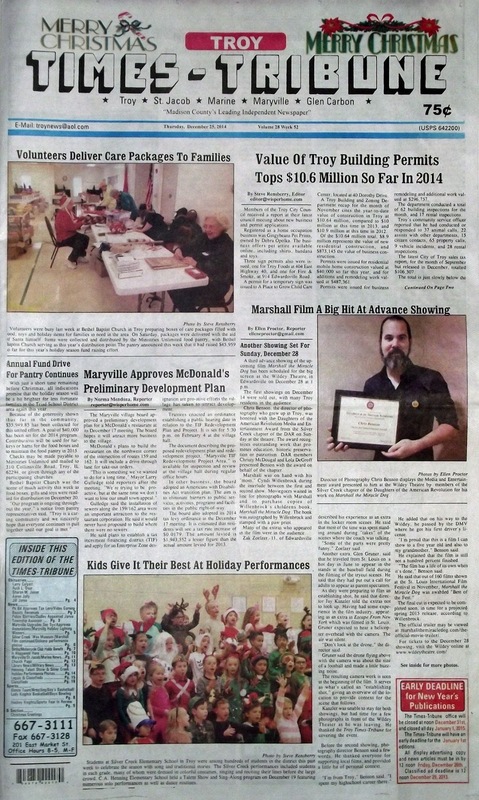 The December 18, 2014 issue of the Troy Times-Tribune is now available! Some of the stories in this issue: Value of Troy Building Permits Tops $10.6 Million So Far in 2014, Marshall Film a Big Hit at Advance Showing, Maryville Approves McDonald's Preliminary Development Plan, Annual Fund Drive for Pantry Continues, Park Board Approves Tax Levy and Ponders No Parking Areas in Park, Video Gaming Machines Boost Revenues for Local Communities, Maryville Upgrades Security System at Fire Department, Village Approves Four Annexations; plus we have police blotters, a photos spread on holiday programs in Triad grade schools, news about upcoming events, an editor's column on eating pie, and lots more! We have obituaries for Larry Colyott, Ruth L. Dour, Sharon M. Joiner, Jill Jones, and Aaron Jolly.